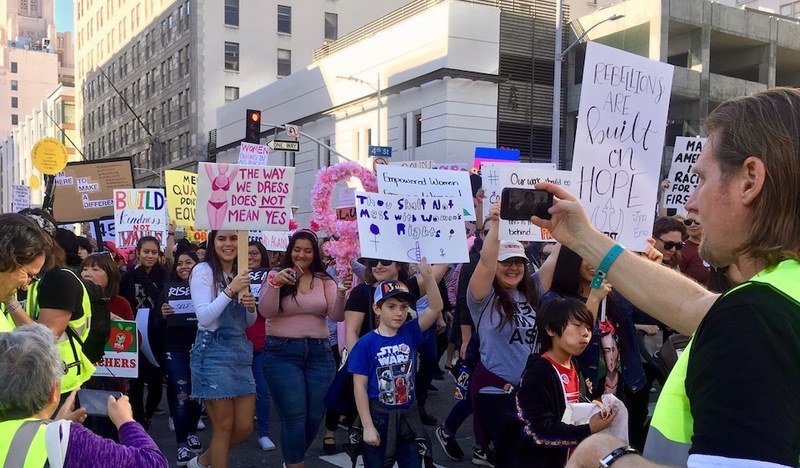 This morning, just like two years ago, Minal and I met up with my writer friend Elline Lipkin at Sierra Madre Villa’s metro station, so we could attend the Women’s March in downtown Los Angeles. 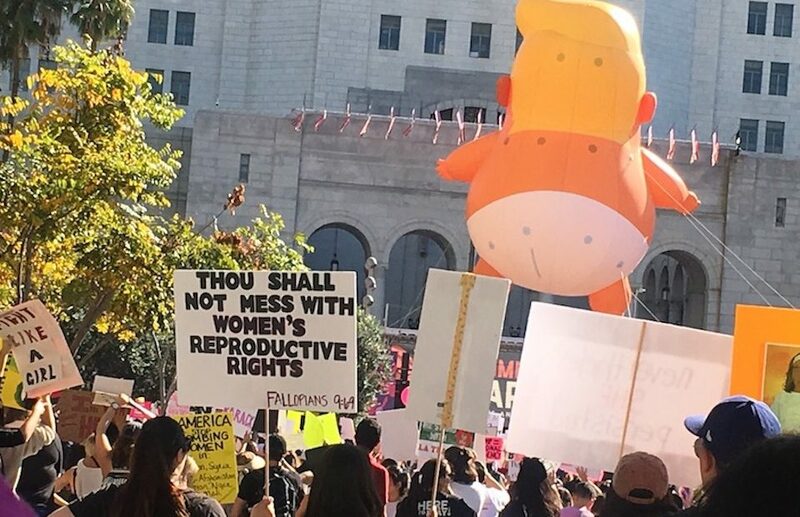 This year’s march was more subdued than the first year when 750,000 protestors gathered in Los Angeles. But we decided to march, so we could register our protest. Some of the chants were familiar: “Hey hey, ho ho! Trump has got to go!” and “No more walls! In Palestine and Mexico!” Also visible were protesters wearing yellow vests, an extension of the protest movement that sprung up in France. Yellow Vest Los Angeles calls for equity in public schools, healthcare for all, immigration reform, housing for all, a public banking revolution and much more. Before we reached toward City Hall, a woman walked up to me. “I know you from somewhere,” she said. We laughed. I flipped my #ENOUGH poster around, and we continued marching. “I’m pretty sure that was Lisa Edelstein who started in the Girlfriends Guide to Divorce, which ended after several seasons,” Elline commented. As we approached City Hall, I passed a woman perched on a wall. Her sign was also upside down. When I informed her, we laughed together. 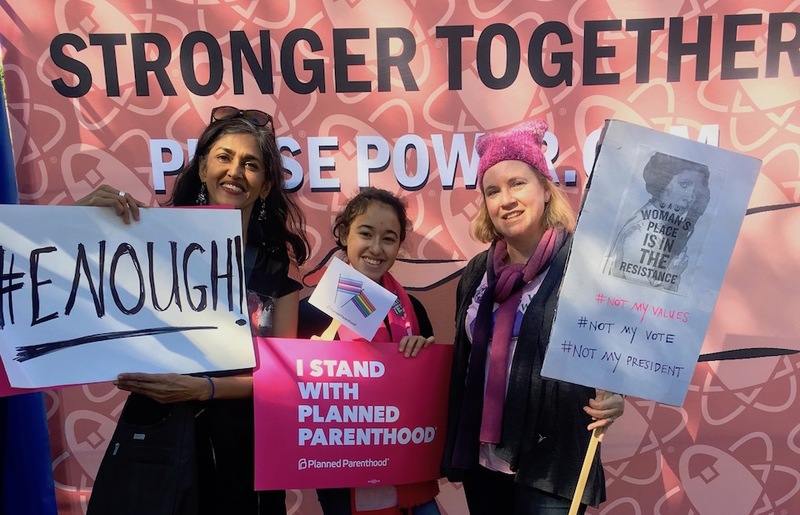 I found myself thinking of Women’s Action Forum marches in Karachi and Take Back the Night marches in New York, and how, after decades of protests, it was easy to forget to hold our signs up the correct way. One of the highlight’s of today’s march was a visit with the women at the Ms. Magazine Booth, where Elline had worked. Because the turnout was low, we had opportunity for a longer visit, and Minal was gifted a Ms. Magazine scarf, and she learned about programs in which she might be able to participate. Once back at Union Station, we ran into a family from Minal’s school. They had also been at the protest. And on the Metro Rail back to Pasadena, I encountered one of my neighbors, who Minal and I had met a few months ago when returning from a March for Our Lives rally, also in downtown LA. “We have to stop meeting like this,” my neighbor joked. We laughed and agreed that we needed to plan a visit that was not centered around protests.